Working on your thoughts is one of the most valuable things you can do for your life. 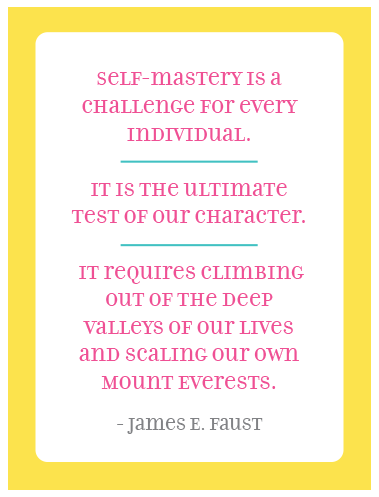 It’s not always an easy journey, as the quote above says…“It requires climbing out of the deep valleys of your life & scaling your own Mount Everests.” But think about how beautiful this world would be if more of us developed self-mastery. And while we can’t change the world, we can change ourselves & have a more positive influence on the world around us. “The Lord compensates the faithful for every loss. That which is taken away from those who love the Lord will be added unto them in His own way. While it may not come at the time we desire, the faithful will know that every tear today will eventually be returned a hundredfold with tears of rejoicing and gratitude”. This challenge has taugh me so much about myself. Thanks so much for everything. “…scaling our own Mount Everests.” Very well said. Thank you for sharing your post on GRATITUDE!! I am going to start the 30 day challenge tomorrow! I’d love to start this challenge…is there anything special I may need to do before starting?